In recent years, lens manufacturers have started launching prime lenses designed for exceptional "corner-to-corner" performance. Digital-era lenses are generally sharp and aberration-free to begin with, so the only way to improve on these great characteristics is to produce something that is as close as possible to perfection across the board. After Pentax entered the full-frame market with the K-1 in 2016, Pentax lens designers were faced with such a challenge: to develop the next-generation fast 50mm prime lens. There was no shortage of 50mm lenses in the Pentax lineup to begin with— in addition to the FA 50mm F1.4, DA 50mm F1.8, and D FA 50mm F2.8 macro, there is also the premium DA* 55mm for APS-C cameras. So, what would a new lens bring to the table? Although the K-1 launched with a compelling lineup of modern zooms, there was a dearth of full-frame primes with weather sealing, silent autofocus, and the level of performance that today's full-frame shooters expect. The new HD Pentax-D FA* 50mm F1.4 SDM AW fills this void for photographers in need of a classic "normal" focal length. The HD Pentax-D FA* 50mm F1.4 SDM AW, pictured above, is the first member of a generation of top-tier star-series prime lenses for digital full-frame Pentax cameras. It follows in the footsteps of competitors such as Sigma (with offerings in Canon and Nikon mounts) and Samyang (with offerings for Pentax and other mounts), who both recently launched their own modern 50mm F1.4 lenses. The large size of this new Pentax lens immediately stands out. Pentax users are accustomed to tiny 50mm lenses, yet this new D FA* 50mm is over four times heavier than its FA-series predecessor. Likewise, at $1199, its price is also over four times higher. Thus, our expectations of this lens are very high— it will have to deliver some truly exceptional image quality to justify the premium price and bulk. Early adopters of this lens were quick to praise it, and in this review, we will seek to verify that praise by checking to see just how well this lens fares in practice. In addition to standalone tests, we will be making direct comparisons to the Sigma 35mm F1.4 DG HSM (Art), the old Sigma 85mm F1.4 EX DG HSM, and the SMC Pentax-FA 77mm F1.8 Limited (all in K-mount) to provide some reference. We also had access to a Sigma 50mm F1.4 Art (not available in K-mount) for some tests, and thus we offer comparative comments on sharpness and aberrations. If you're a Canon or Nikon user, you can pick up a Tokina-rebadged version of the Pentax D FA* 50mm as an alternative to the Sigma. Without further ado, let's jump in to our review of this next-generation beast! 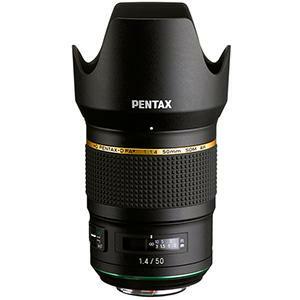 Ready to get your HD Pentax-D FA* 50mm F1.4 SDM AW? Click below to place an order or check current pricing.